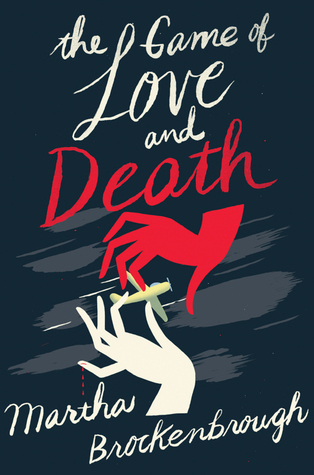 THE GAME OF LOVE AND DEATH is the latest novel by Martha Brockenbrough, and we're honored to have her with us today to share more about it. What was your inspiration for writing THE GAME OF LOVE AND DEATH? For me, there are only two things that really matter in life: the fact that we all will die, and the role love plays in the time we have. I wanted to write a story about this bittersweet tangle, and I wanted it to be as hopeful, as heartbreaking, and as beautiful as possible. It was ambitious to be sure, but my life will end someday, and I wanted to say these things and make a piece of art about it before I die. There are a lot of scenes I love (and the whole book was a challenge), but I don’t want to spoil things. Let’s just say, though, that there is death in this book, and I wrote some pretty juicy death scenes. Some of them, I wrote in my neighborhood cupcake shop (a place FULL of writers, including Sherman Alexie, Lish McBride, Jennifer Longo, Mary Jane Beaufrand, and Tara Conklin). It was embarrassing to cry into my coffee, but I did. I did it for you, readers! I did it for you! How long did you work on THE GAME OF LOVE AND DEATH? You could say I worked on it my whole life. One scene, the explosion of the Hindenburg, goes back to my sixth grade science class, when my teacher played the audio recording of this disaster. It’s haunted me ever since. There’s a lot of stuff in the book that comes from personal experience. But practically speaking, I spent about three years writing it. I have 31 drafts in my folder and countless pages of notes. That is a great question. The book is complicated. It has four main viewpoints (plus a couple of others when the story demanded it). Four separate storylines have to converge at the same point, and four separate character arcs have to peak simultaneously. It’s also historical (with a fantasy element), and that demands a certain level of accuracy. I also took that accuracy thing pretty far and made sure the days of the week and moon phases were accurate, in the hopes that nerds like me would look these things up and be delighted. But really, it taught me that taking on something that scares you and is way too hard and takes you a long time and sometimes reduces you to despair is worth it. The reception this book has received, particularly from authors I really admire, has been thrilling. It doesn’t mean that all of the gambles we take will pay off, or all of the work will turn out as we hope. But I’m much less fearful of failure. Failure isn’t a permanent state. (Nothing is permanent. To quote the book, “Someday, everyone you love will die. Everything you love will crumble to ruin. This is the price of life. This is the price of love. It is the only ending for every true story.” But what can be a permanent state for the duration of our lives is one in which we love fearlessly—and not just people, but our work. If you love and work in a way that assumes things will turn out, there is a lot more joy, even as you encounter obstacles along the way. What do you hope readers will take away from THE GAME OF LOVE AND DEATH? That we have no time to waste. That life is beautiful, that love is complicated, and that Death haunts us all. Each book is different. I also write picture books and nonfiction, and those forms have some different demands. But for writing novels, I did experience a moment where I understood how plot and structure and the role of scene come together and become more than the sum of their parts. This doesn’t mean I get it right the first time and every time I sit down to write a book. For me, there is still a lot of struggle and writing and deleting and pacing the floors and lying down with my eyes closed so I can think. I’ve tried plotting beforehand and writing by the seat of my pants, and neither method spares me the sometimes dispiriting knowledge that whatever I write will need to be rewritten as I understand my characters and the ideas behind the book better. The overall goal of the kind of story I want to tell is one that gives readers an unforgettable experience. I want to create characters who engage (they don’t have to be likable, just interesting); scenes that evoke emotion; and choices that engage readers’ minds. In other words, they can’t be easy choices. They must be ones with more than one reasonable answer, involving sacrifice that counts for something. There is no one ritual. I am not happy, though, if I’m not working on a book. The challenge, wherever I am physically, and wherever I am in the process of a book, is to clear that hurdle of doubt. Sometimes I listen to music, but never when I am writing because it’s too distracting. And it’s worse for me when it comes from my computer’s speakers instead of through headphones—that’s how fussy my brain is. I do listen to music to get myself into an emotional state, and for The Game of Love and Death, listened to Death Cab for Cutie’s song “You Are a Tourist.” The fire imagery in that song found its way into the book, along with the truth that we are but tourists in life if we don’t live with our own truths. Think of yourself as the child you once were: wide-eyed and full of wonder, but also bewildered by the world around you. What would you say to that child as he or she attempts something difficult but important? That’s the voice you should use to encourage yourself as you work. Kind, full of faith, but also fully aware that success will only come after many temporary failures. I’m working on a few things, but chief among them a novel narrated in part by a rat. There is a malevolent forest, a mathematical monk, a musical girl, and a book that does harm. (So far, all of my novels have included a book and music in them. We’ll see how long I can keep that going.) As a reader, I like books that feel different from others I’ve read, and that’s what I strive to create as a writer—I want to give you something strange and beautiful and wonderful. This is another way of saying it’s going to take a while … so stick with me. What did you think of our interview with Martha Brockenbrough, author of THE GAME OF LOVE AND DEATH? Let us know in the comments!